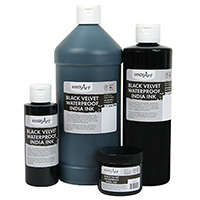 Handy Art® Black Velvet India Ink is a rich, smooth flowing, waterproof opaque ink. Our high quality, water-based, permanent ink can be used in pens, with brushes or even as a wash for a multi-media project. Handy Art® Black Velvet India Ink is certified AP non-toxic.